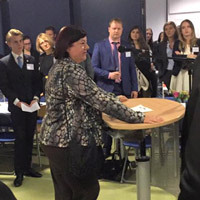 Webster international relations faculty member Nives Rumenjak addressed students at the beginning of the event. Webster University students and faculty at the Leiden campus took part in the Japanese Tables Evening hosted by SIB Leiden, where students and guests were granted the unique opportunity to interact and converse with up to 40 different ambassadors in one evening. Marnix Francot, a Webster student majoring in international relations at this campus in the Netherlands, said students relished the opportunity to speak with ambassadors and diplomats from all over the world. Nives Rumenjak, faculty member and coordinator of the international relations program at Webster Leiden, addressed the students at the beginning of the evening and reminded them that as global citizens they must be conscious of their ability and duty to shape the world. "The ambassadors and diplomats were very helpful with topics including Brexit, European trade agreements, the refugee crisis, and more," said Francot, a leader with Webster Leiden IR Club. "Overall, it was a great experience, I would highly recommend it to all students in the future, and we are thankful to the organizers and SIB Leiden for this collaboration."